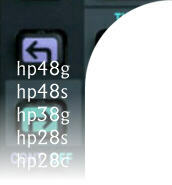 Welcome to hpcalc.org (https://www.hpcalc.org), the premier source of software for and information about the HP Prime, HP 50, HP 49, HP 48, and HP 28 RPN programmable graphic calculators and the HP 38G, HP 39, and HP 40 programmable graphic calculators, with 8979 files by 2542 authors and 4201 screenshots totaling 1547.49 MB. If you are interested in purchasing an HP calculator, I sell several models (such as the Prime and the 50g). Please see my commerce site if you are interested. You may now create an account on hpcalc.org. By creating an account and logging in, you will be able to rate programs, write comments about programs, customize the display of this site, and download old versions of programs.. Please click here to create or manage an account. See older additions or subscribe to the RSS feed. You are visitor 20952914 since Thursday, August 21, 1997.
hpcalc.org is maintained by Eric Rechlin. Last updated Tuesday, April 9, 2019.